In five of the eight years since 2010, over half the taluks of the 176 in the state (prior to 49 taluks added last year) have been drought-hit. 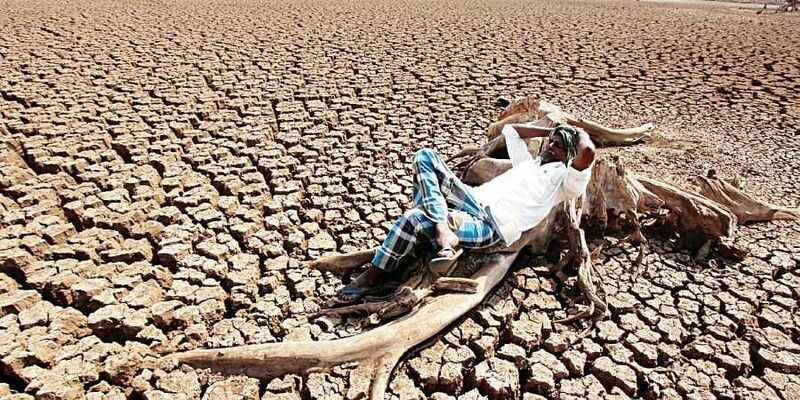 BENGALURU: Drought has become an all too common feature in many parts of the state lying in the Deccan Plateau. More so in recent years. 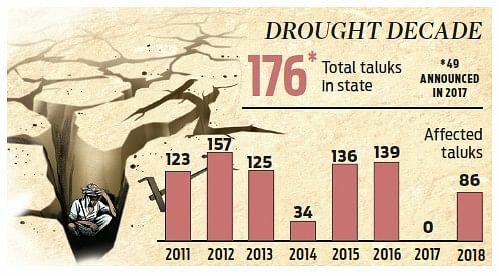 In five of the eight years since 2010, over half the taluks of the 176 in the state (prior to 49 taluks added last year) have been drought-hit. Karnataka has been witnessing drought since 2001. And, as many as 37 taluks in the state have been affected in 13 of the 14 years. Four of these — Chikballapur, Raichur, Aland and Jewargi taluks — have been drought-hit in all the 14 years. The 37 taluks are located in 14 districts. Experts feel that the situation could aggravate with global warming affecting the monsoon pattern in the region, which would worsen the crisis in days to come. Helping people acclimatise to such conditions will be essential for their welfare, they said. Data from the Karnataka State Natural Disaster Monitoring Cell (KSNDMC) showed that districts adjoining Telangana and Andhra Pradesh have been affected more frequently by agricultural droughts. Vishwanath Biradar, scientist at the University of Agricultural Sciences, Bengaluru, said analysing rainfall for the last four decades showed that the districts received normal rainfall once every two to three years. “However, the recent erratic rainfall is worsening the condition of the region,” he said. “If we look at the total rainfall received in a year, the data may appear normal. But the rainfall is not timely for crops. For instance, a taluk may receive 80-100 mm, equivalent to about a months rainfall in one go followed by a dry spell of four to five weeks, which won’t benefit anybody,” he said. People expect rainfall to start by mid-June in the region, he said, but over the past few years there has been only sporadic showers in June. It appears as if monsoon is shifting to August and September as good rainfall is being recorded during these months, he added. G V Srinivasa Reddy, director, KSNDMC, said though the region is historically dry, there has been a change in spatial and temporal distribution of rainfall. “Extreme weather events such as short bursts of heavy rainfall followed by prolonged dry spells are increasing,” he said. Noting that the affected regions are ‘typical migration areas’, he said training people with adaptability and resilience will be essential to thwart a crisis in the coming days. Many rainwater harvesting programmes are aimed at these districts. Programmes are being initiated to make them less vulnerable to drought like in Kolar, which too receives low rainfall, but where the dependence of people on rainfall is less, he said. While drought has affected 86 taluks, mostly in North Interior parts of the state, freak weather conditions have caused floods in 45 taluks. Extremely heavy rainfall in Coastal and Malnad regions had caused floods in Kodagu, Daskhina Kannada, Shivamogga, Udupi, Uttara Kannada, Hassan, Chikkamagaluru and Mysuru. The landslides due to rains had blocked Shiradi and Sampaje Ghats — two main roads connecting the Coastal regions to the state’s mainland. The list of flood-affected taluks was announced recently.